Poop is not a laughing matter. Scientists and doctors have found that it is a byproduct of a diverse community of bacteria in your gut that impacts your health in all sorts of ways. 1. Poop is not old food. Actually, poop is not just remains of food you ate. 50-80% of it is bacteria that had been living in your intestines. It also includes some indigestible plant matter such as the cellulose in vegetables. And of course there is water. 2. Why is it brown? The colour of your faeces is a result of a chemical called stercobilin. It can be a byproduct of the hemoglobin in broken-down red blood cells. Also it comes from bile, the fluid secreted into your intestines to help digest fat. The ideal stool should be of a deep chocolate colour. Other colours of poop can be a sign of other conditions. Men and women’s digestive tracks work a little bit differently. Women have wider pelvises than men. As a result, their colons hang a bit lower than men’s, and are a bit longer: on average, by ten centimeters. Finally, men have more rigid abdominal walls that help push food through the GI tract more effectively. There is no single ideal poop, but there are some characteristics that are a sign of a healthy digestive system. It should be very easy to pass — almost effortless. And it should take the form of a continuous log. Finally, poop should sink, not float. Floating stool is usually a sign of poor nutrient absorption or excessive gas. The key to good poops is eating a lot of plant fiber. The widely observed corn-kernel-in-poop phenomenon has a simple explanation: corn is made of cellulose, that indigestible plant fiber. This is also true for some other plants. 7. People living in different parts of the globe have different poop. 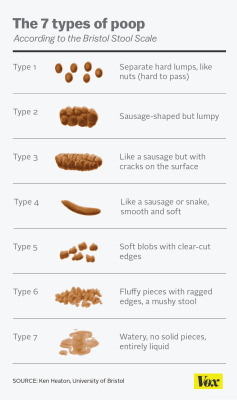 This is simple: different diets lead to different types of poop. The faeces of most people in the developing world is noticeably different from that of people eating a Western diet, mostly because the latter contains so much less fiber. Poop of newborn babies is called meconium. It looks like a dark green sauce. It’s the result of nutrients consumed by the infant inside the womb: amniotic fluid, blood, skin cells and mucus. Usually this substance is odourless.